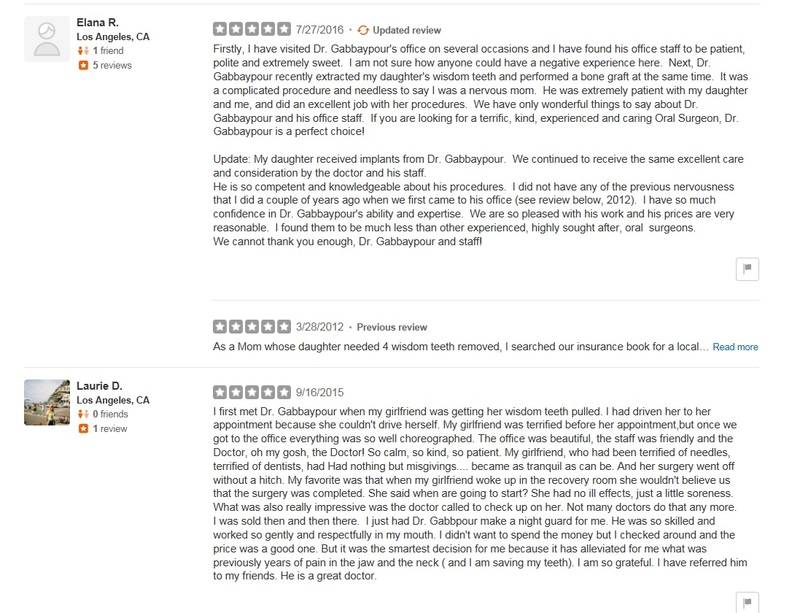 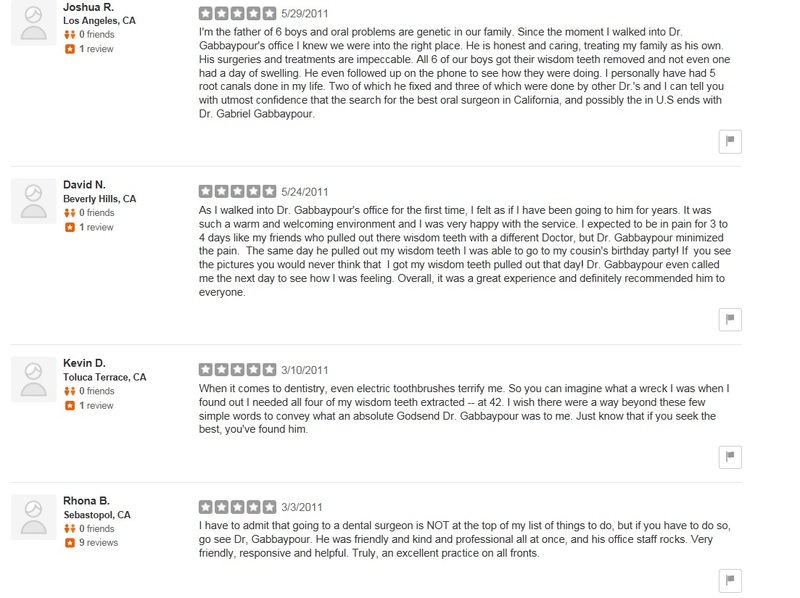 Dr. Gabbaypour is known for his technically superior care with an emphasis on exclusivity, comfort and autonomy that has set the standard in his field. 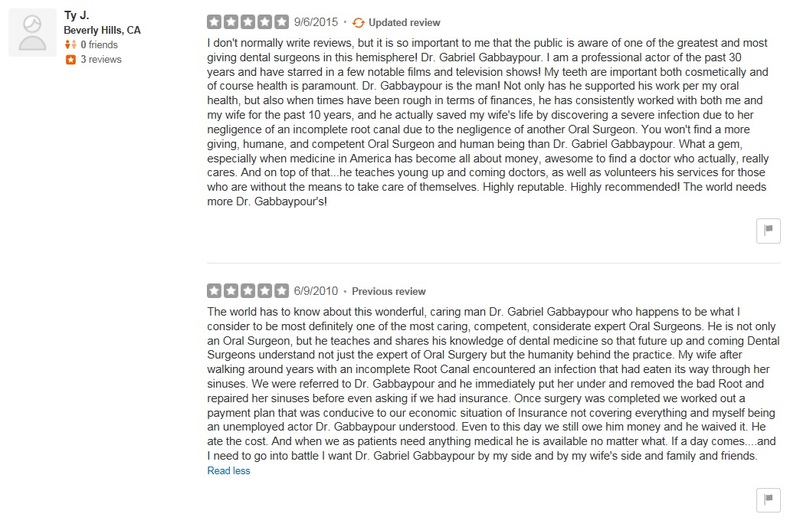 Dr. Gabbaypour has spent upwards of a decade pursuing medical and dental education in prestigious dental, medical and surgical trainings for the treatment of congenital and acquired craniofacial abnormalities, reconstruction of cancer and trauma deformities reconstruction of the jaws and oral cavity with dental implant. 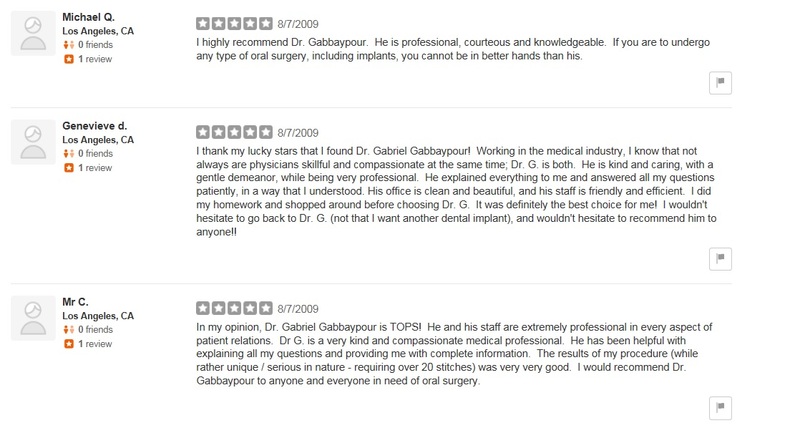 Read more about Dr Gabbaypour here. 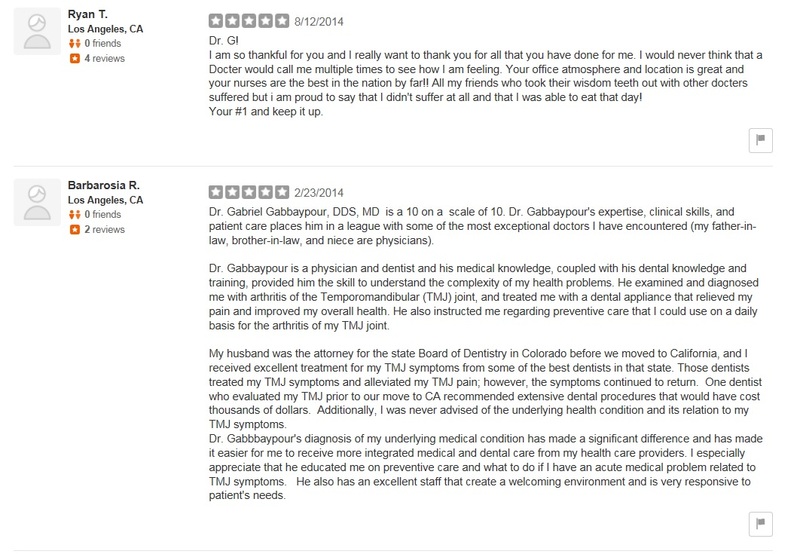 Whether you want to maintain your healthy smile or you have serious dental or cosmetic concerns, we can help. 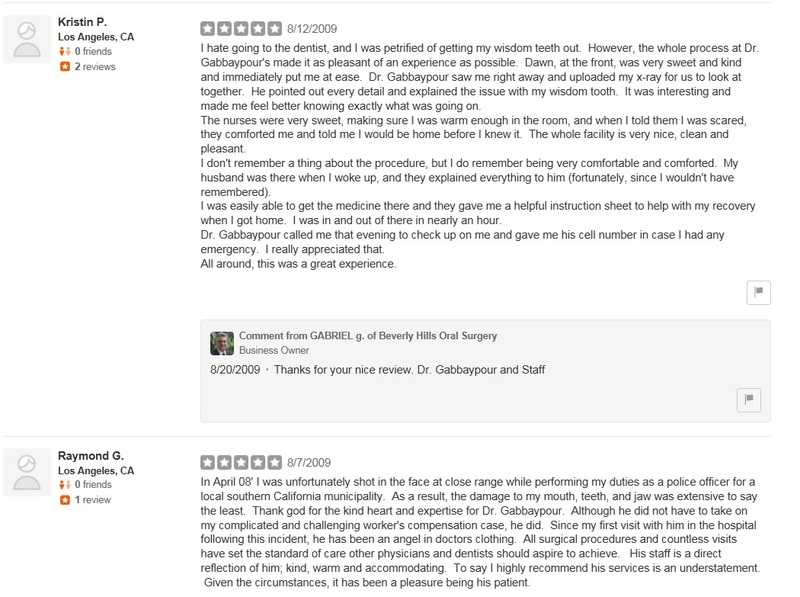 we welcome patients of all ages to our office, which provides comprehensive Oral & Maxillofacial surgery. 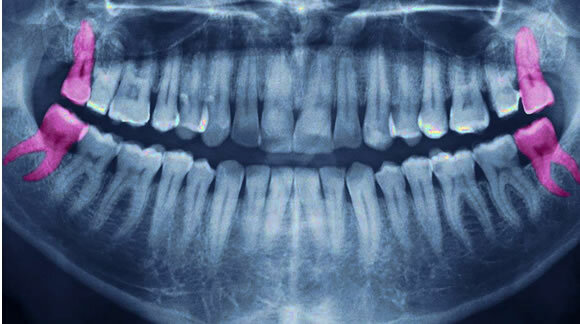 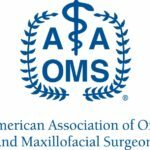 We work at the forefront of Oral and Maxillofacial Surgery and Implant dentistry and are committed to providing each of our patients with the high-quality care that they need to get the smiles that they deserve. 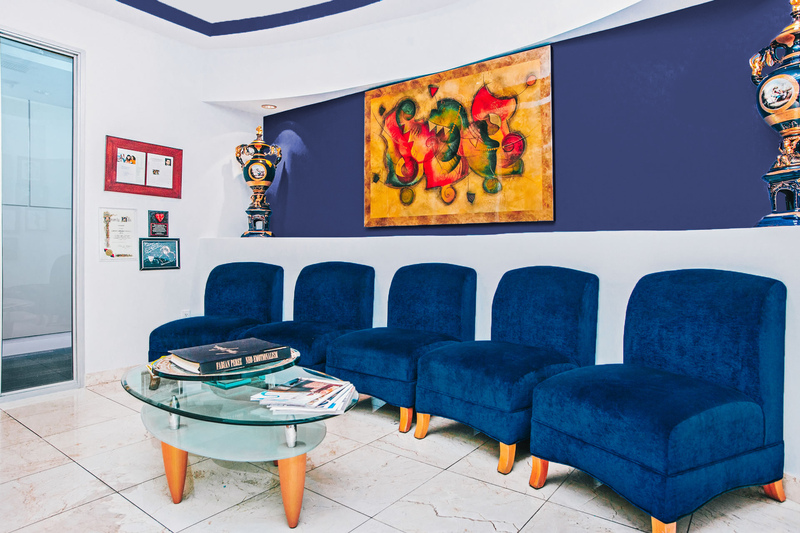 Our office has been carefully designed with the needs of our patients in mind. 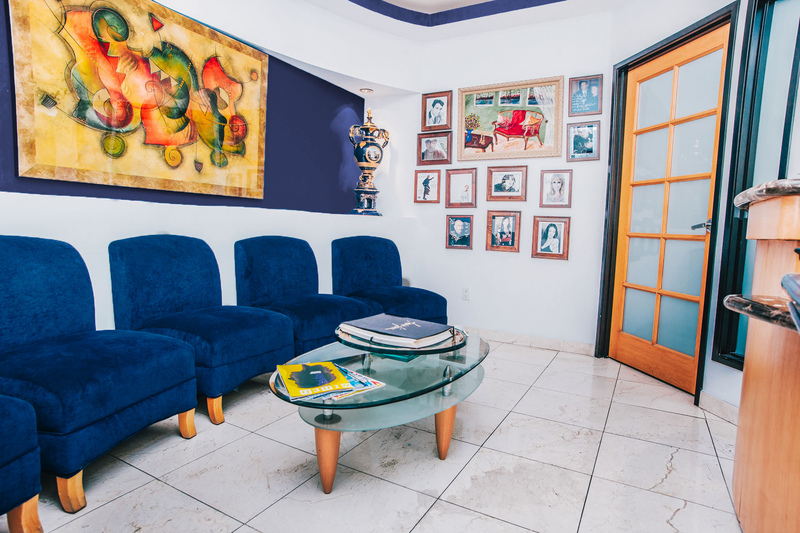 We use the latest technology, advanced imaging and luxurious amenities to help you feel right at home. 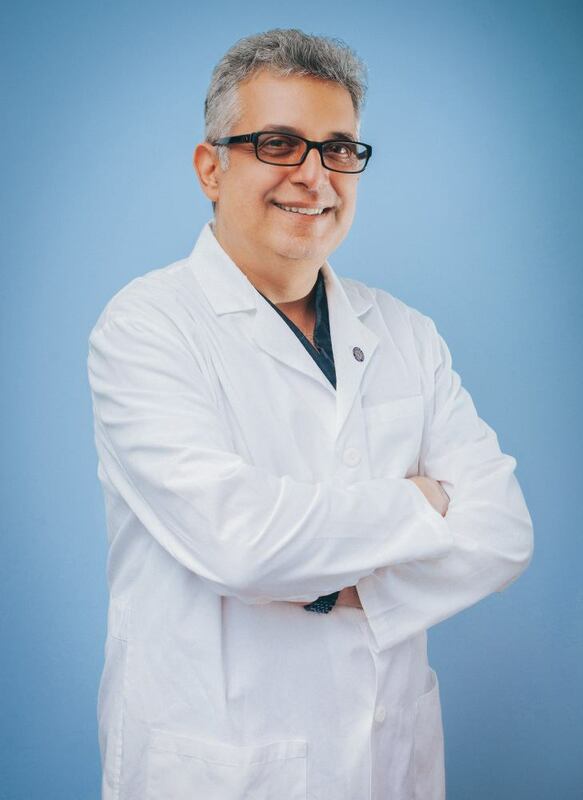 Beverly Hills Oral Surgery also has a kid-friendly office environment that allows children to feel more comfortable as they learn the basics in dental care and discover how they can keep their smiles healthy for life. 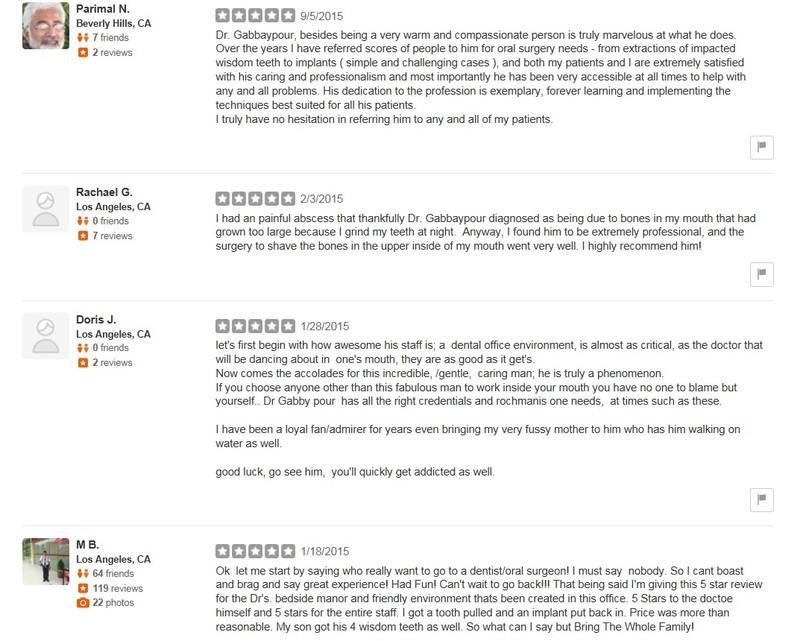 Our staff is warm and friendly and enjoys getting to know our patients. 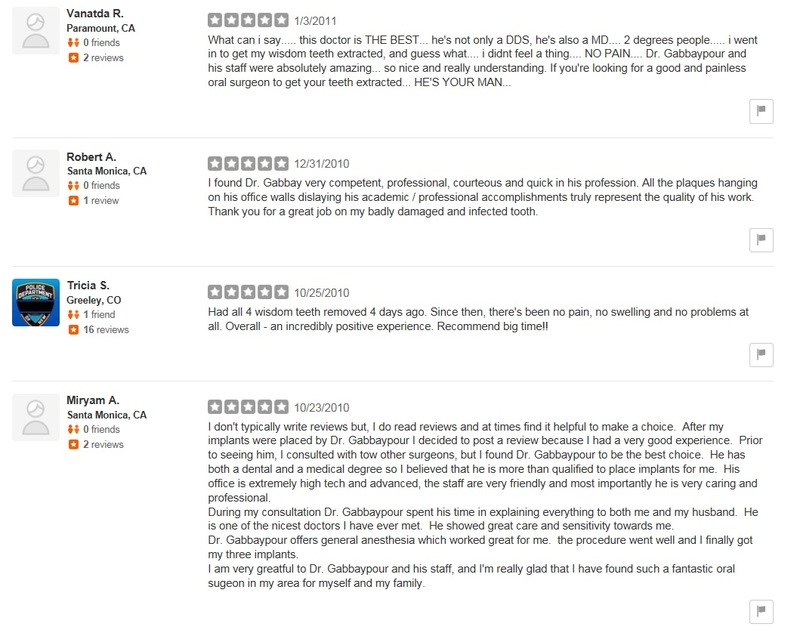 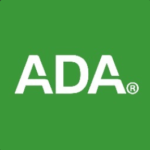 Our goal is to provide you with compassionate treatment and personalized care. 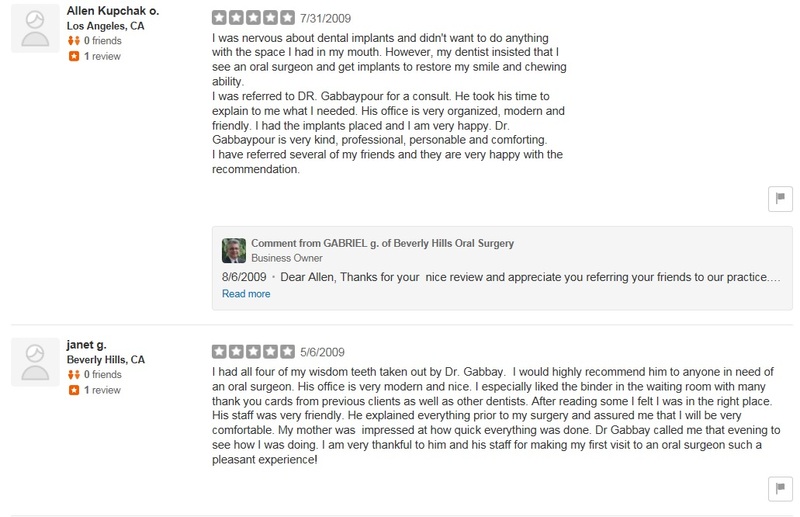 Beverly hills Oral & Maxillofacial Surgeon, Dr. Gabriel Gabbaypour, DDS, MD practices a full scope of oral and maxillofacial surgery. 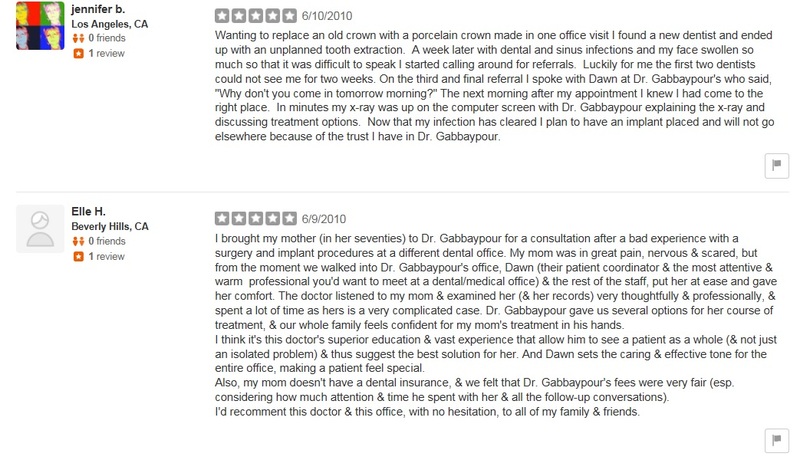 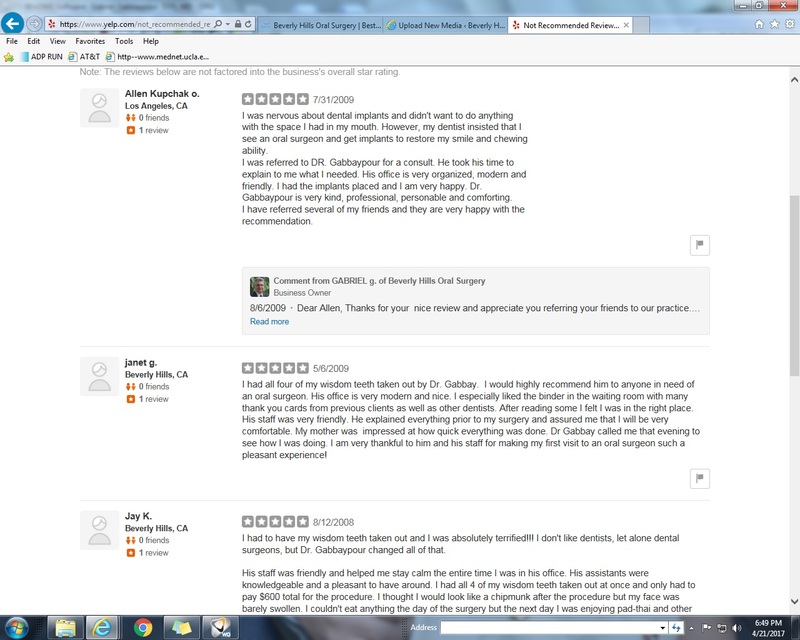 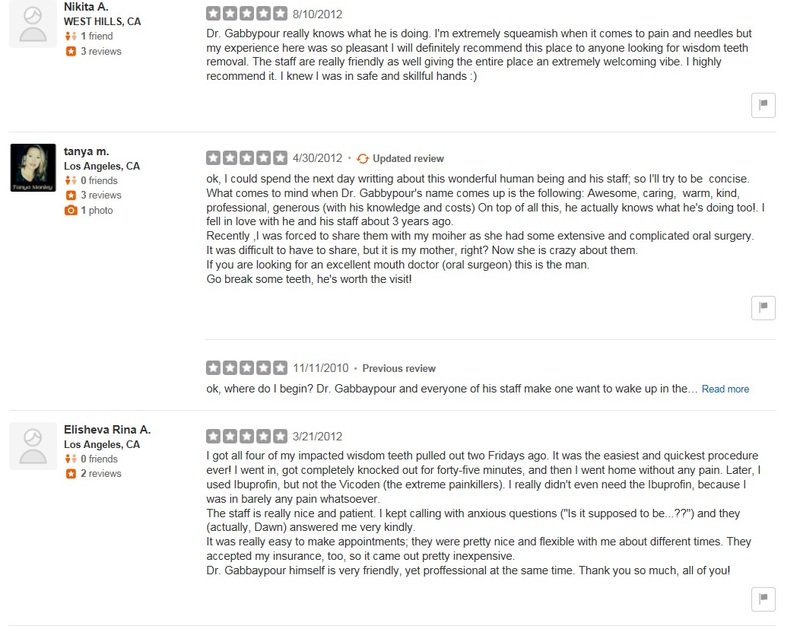 Dr Gabbaypour is inspired by compassion he wants your experience with us to be pleasant and comfortable. 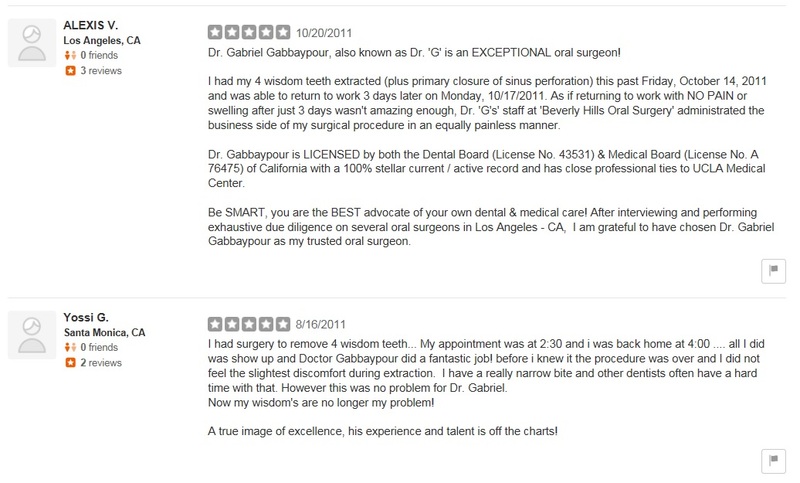 Dr Gabbaypour expertise ranges from removal of wisdom teeth to very complex reconstructive surgery of the face and jaws. 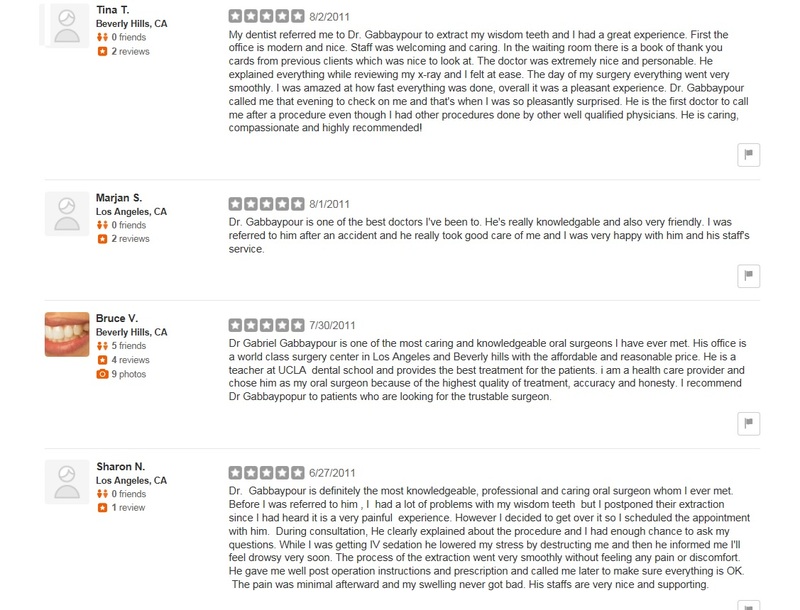 He is a top expert in diagnosing and treating Facial pain, TMJ disorders and sleep apnea. 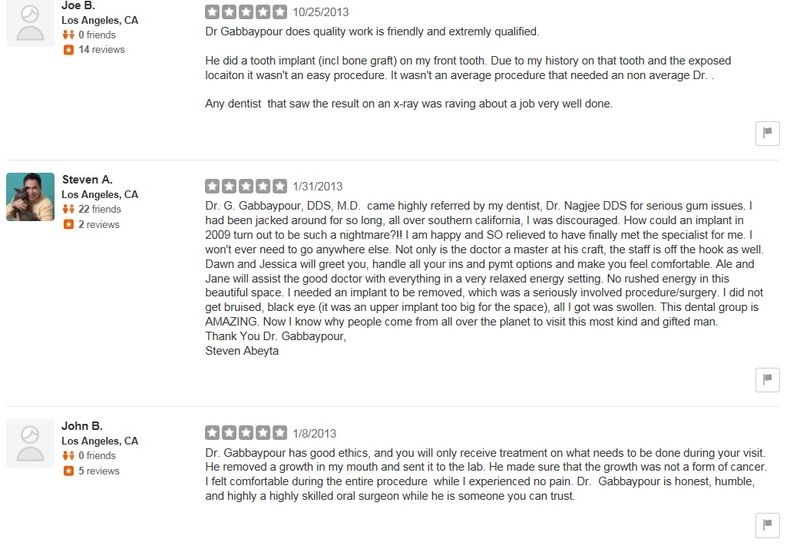 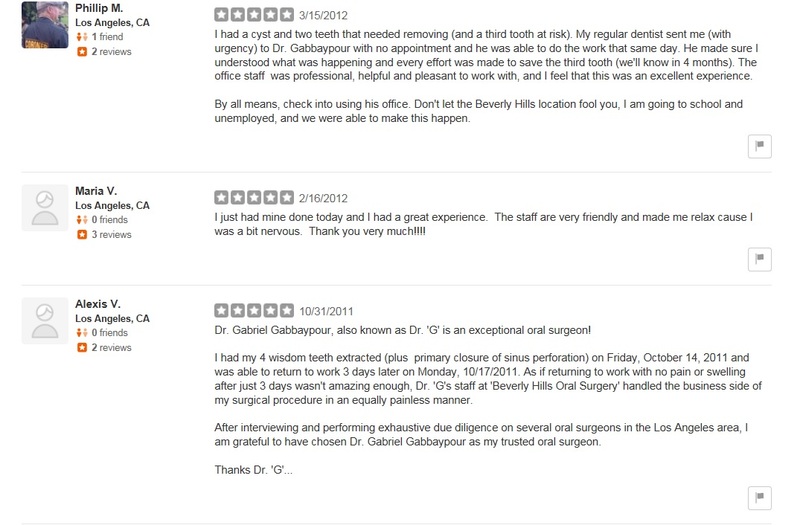 At Beverly Hills oral surgery Dr. Gabbaypour performs a full range of Dental implants and bone grafting procedures. 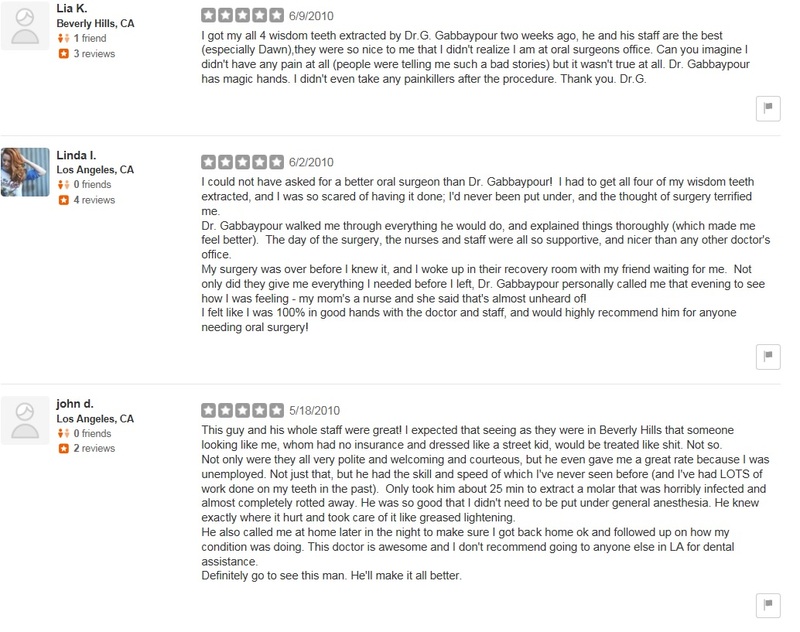 Dr. Gabbaypour’s staff is fully trained in assisting with I.V. 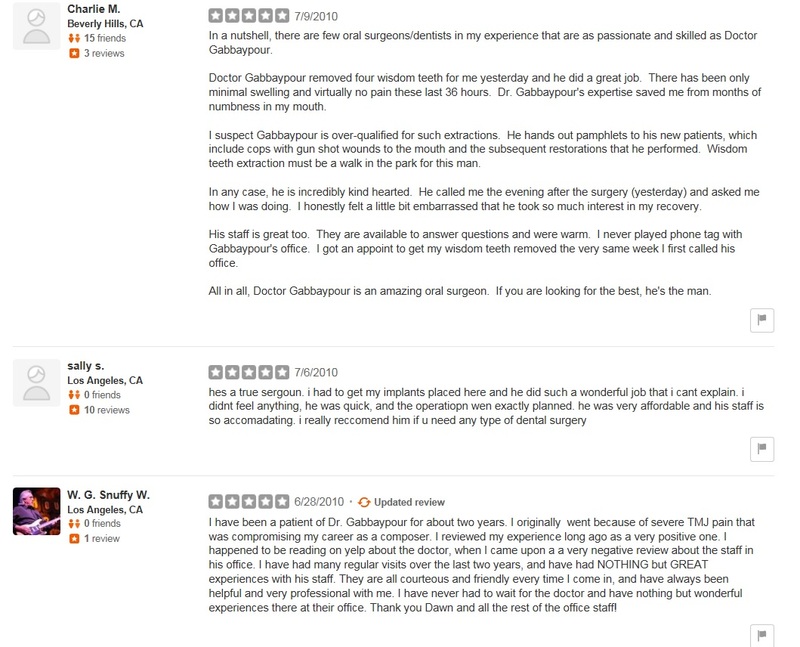 sedation, general anesthesia within our state of the art office setting. 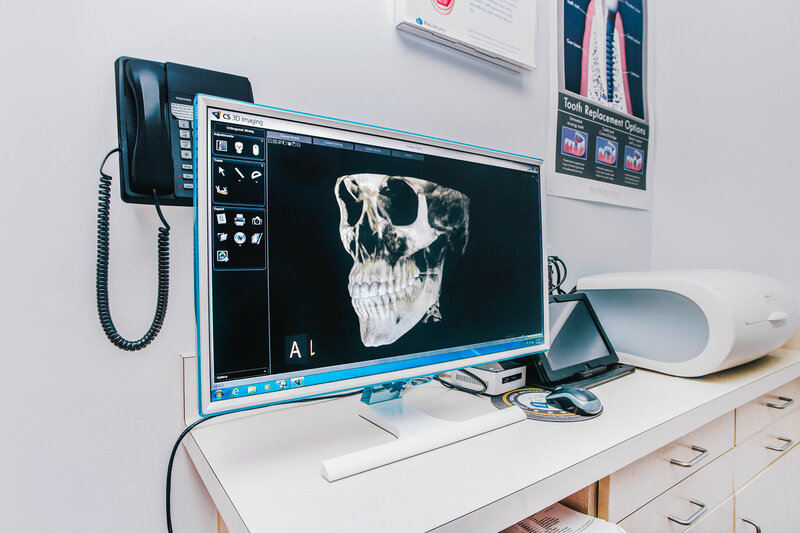 Our office is equipped with state-of-the-art technology, such as low-radiation digital x-rays and continuous electronic monitoring during anesthesia. 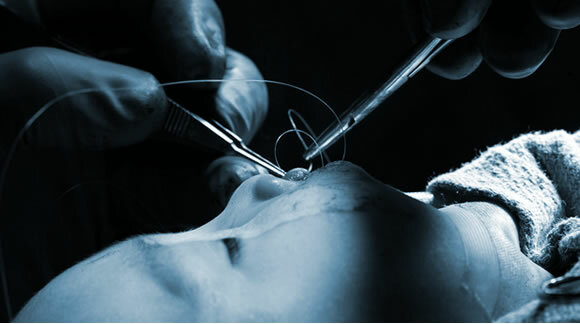 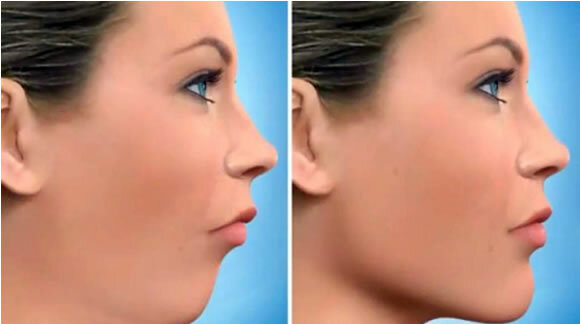 With experience and gentle surgical technique and by using the most advanced treatments available, our patients are able to return to their normal activities with minimal down time after their procedures. 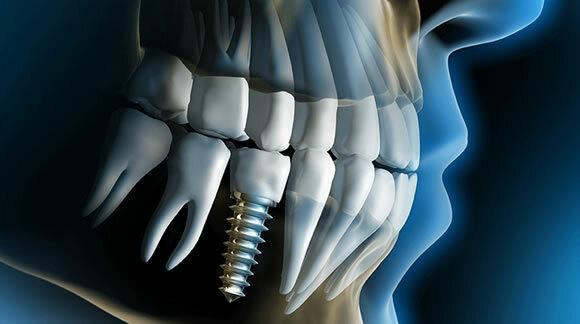 Our team performs the latest in grafting procedures, including bone grafting restoring the supporting structure for teeth and dental implants to as healthy. 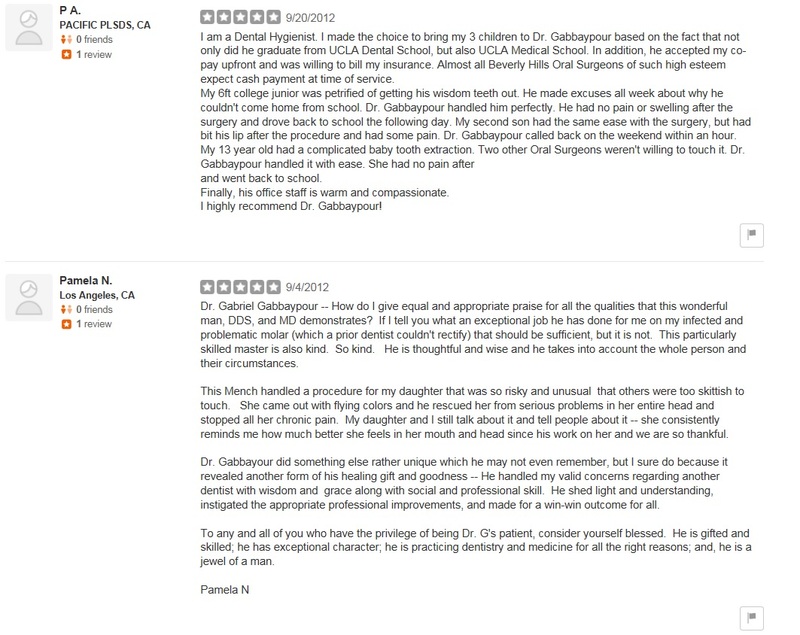 Our office is located 465 North Roxbury Drive Suite 815 Beverly Hills California 90210.